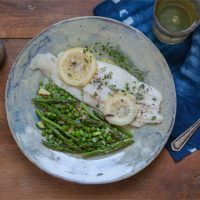 If you have a sensitive stomach and commonly suffer from IBS and digestive discomforts, this low FODMAP fish recipe is for you. 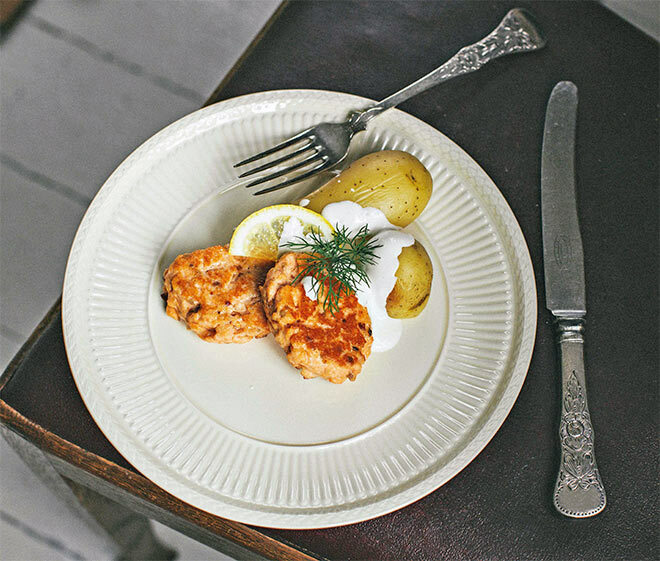 The recipe for these healthy salmon fish cakes has been created by Cecilie Hauge Ågotnes who has just launched her new cookbook called ‘Calm Belly Cookbook‘. Also if you don’t suffer from food sensitives, this fish meal idea is great to try as it’s so easy to make and does not require too much effort. It would make a lovely mid-week dinner. Calm Belly Cookbook is full of low FODMAP recipes, suitable for those suffering from various digestive issues. Today, digestive disorders such as IBS and Crohn’s are increasing with as many as 15-20% of the population now possible sufferers (many of them undiagnosed). If you have issues with your digestion and cannot identify the cause, it’s recommended to go on a FODMAP diet where you exclude all the possible foods that may cause reaction. These foods are the carbohydrates which you may have trouble digesting (called FODMAPs) such as beans, legumes, cabbage, onions, etc. After a while, you re-introduce small amounts of FODMAP foods to find a level of tolerance without the symptoms returning. You may discover that you cannot tolerate certain foods at all (for example milk) but you may also discover that certain foods are ok but not in big quantities. And this is where the low FODMAP diet comes in – you basically reduce or totally avoid eating foods with high FODMAP. With Calm Belly Cookbook you will be able to make a wide range of low FODMAP dishes, suitable for breakfast, lunch or dinner. In the book, you even have a section with low FODMAP sauces and seasoning, so basically everything you need for a low FODMAP diet. The cookbook also contains meat dishes so it’s not exactly for vegetarians although you could always replace meat with meat substitutes. 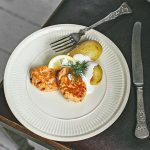 The low FODMAP recipe for Salmon Fish Cakes is my favourite recipe from the book and that’s just because I eat salmon often and these fish cakes are so easy to make. Just blend the ingredients in your food processor or blender and fry the mixture in a little bit of oil. Serve with some boiled potato. Who doesn’t like a quick and easy dinner like this? I would also add a side salad, of course, just to get those extra vitamins in! Put the salmon, egg, cream, ginger, balsamic vinegar or lemon and salt and pepper into a blender and process until finely chopped. Chop the spring onions and add, mixing well. Cook a small portion of the mixture and taste to see if you need to add a little more salt and/or pepper. Heat the butter or oil in a frying pan over a medium heat and drop in tablespoonfuls of the mixture. Fry on each side for 2–3 minutes. Do not over-cook as they will become dry. Serve with 2–3 potatoes per person, soured cream or natural yoghurt, dill and lemon. For an extra kick, add a little grated horseradish to the fish cake mixture. To make this meal extra healthy, add a mixed salad on the side. Do you follow low FODMAP diet? Are you going to give this healthy fish recipe a go? Calm Belly Cookbook is available to buy in all good bookshops and at Amazon.co.uk. I’m drooling all over my keyboard while looking at the pictures!will definitely try this fish recip. thank you so much!looking forward for more recipe. The salmon cakes are awesome and so easy to make. I would take the skin off before blending.